Here are some tools we practice every Monday night. Use them to help a friend who is suffering from sadness, anxiety, depression, stress, fear, and other issues. These are tools specifically to help you listen, hear, clarify and help your friend create action steps. 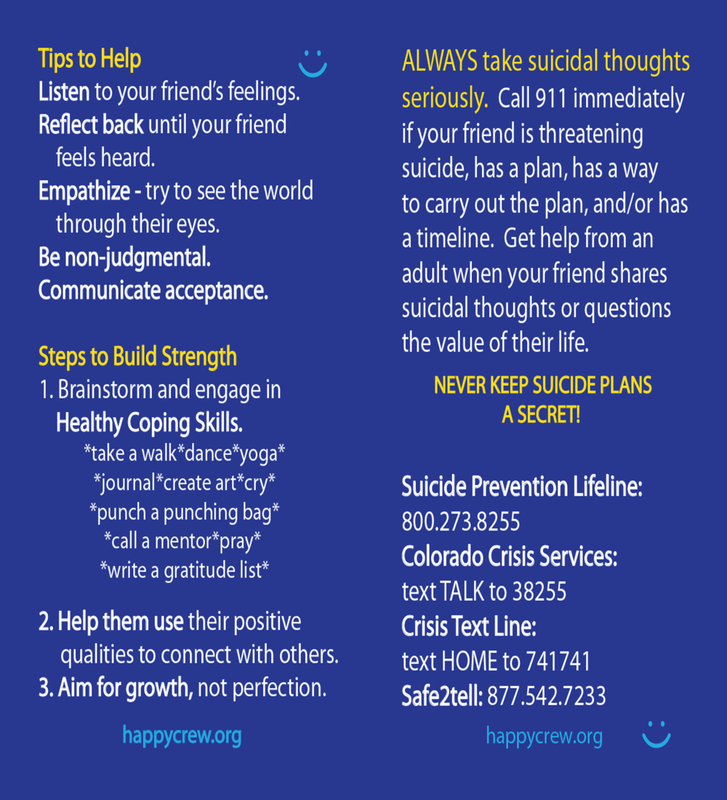 If your friend is suicidal, do not hesitate, call 911 immediately and then call another adult to help you! Make sure you are really hearing what the other person is saying! Repeat back exactly what you heard until the speaker says, “Yes! That is it! That is what I am saying” Then and only then ask follow up questions. 2. Help your friend make space for breathing room, between their thoughts and their feelings. Ask them to breathe deeply and concentrate on their senses. What do they feel, see, hear, taste, smell. Then remind them that how you think about feelings is important. Here’s where you can help make some space – ask them to change from saying, “I am anxious” to “I am having the thought that I am anxious.” There are other thoughts in their minds too – help them to see them as leaves on the lake that are bombarding their boat – but remind them that they are in a boat, safe, able to weather the storm. Making some room in your mind allows you to see many possibilities and solutions! If the feelings are overwhelming them, ASK – are you considering suicide. Don’t worry about putting it out there. Your friend needs to know you will listen and help. 2. IF your friend is thinking about it, listen to all their feelings, and offer to help them contact an adult. If they refuse to contact an adult – you need to bring in a parent, teacher, or counselor. 3. If they have a plan, access to a weapon and a time – do not leave them and call for help. 4. ALWAYS TAKE MENTION OF SUICIDE SERIOUSLY! Contact a Happy Crew leader every time – we are here to help!